Unroll Me - Unblock the slots is a free puzzle app game that's actually kind of fun. As soon as you turn the game on, the white ball will start rolling - slowly. You must quickly shuffle the tiles around to create a path to get it to the red square. See the silver squares? They're fixed in place. I wasn't sure what to expect when I saw Knotty Ropes listed as a puzzle game app. It's actually just another Planarity type game where you have to move the points around so that no lines intersect. I've played hundreds of levels of this type of game before. So I'm kind of done with this genre. However, I actually love the user interface. it's elegant, appealing and I actually enjoyed these. Happy Hexagons is very similar to Flood It. The object is to turn all of the hexagons into the same color. You start with your man being in the top left corner. If the hexagons adjacent are red, then you turn yourself red and absorb the newcomers. Like the Borg in Star Trek. We've seen this type of puzzle many times before. Nothing great. But you get a smiley face when you succeed with a certain number of moves. Neon Thrust came out in 2011. But it was recently promoted as being free, so that's how I discovered it. It's really an arcade game. The object is to propel your man, the green square with a jet pack, to pick up the green squares and shining star, and then return home to the yellow line. If you see any red squares or line, try not to touch them or you'll be killed. There are 60 levels and I've done 11. My hand/eye coordination is just not good enough for #12. Neon Thrust is not a pure puzzle, but it's fun! 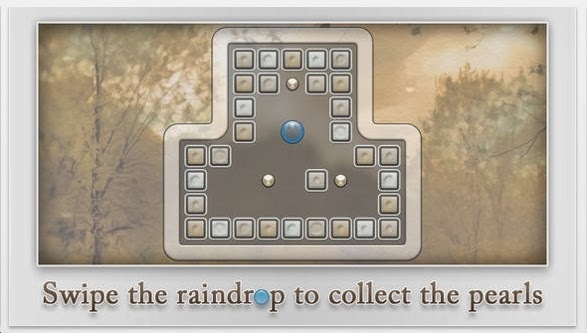 Quell Memento is the latest from the Quell line of puzzles. They're all very good tilt maze games. The object in Quell Memento is to pick up all the tokens. There are wormholes, and spikes that will kill you. All of the puzzles are challenging. The overall theme, graphics, interplay - very slick. What's new in Quell Memento? Well, now you must pass by the colored tiles and change their color. About 2 years ago I wrote about Grooh . About 6 months ago I wrote about Colorooh. I really liked both games a lot. The same company has recently produced Buffalooh. Buffalooh resembles Fling and Lunar Lockout. The object is to bump the bison one at a time off the grid until only 1 is left. Bonus points for you if the last buffalo standing is golden. There are 50 of these levels and they're good! Here's where the game is different from Fling: If the bison is going to crash into another bison's flank, he will occupy that bison's space. If the bison crashes into him head-on, he will land in the square right before him. Finally, if he crashes into the bison's rear end, that bison will then gallop off in that direction. There is another game within the app that is very similar called Coins. Here, the object is still to get 1 bison left standing. The second objective is to have the departing bison pick up the gold coins on their way out. Again, 50 levels. Another version is called Happy 3. Here the object is to end up with 3 buffalos, but they must end up on specific squares. I've done all of these levels and enjoyed them. Some are too easy though. The fourth version of Buffalooh is a timed exercise. How many of the regular puzzles can you solve before time runs out. I'm #5 on the Leaderboard. Buffalooh is definitely worth your leisure time! It's free! '1 to 25 Numbers Challenge' comes from Peter Li. 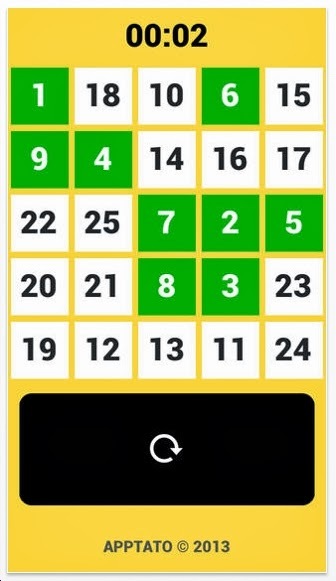 It is a game where you have 10 seconds to tap the numbers 1-25 in order. For each game, the numbers are scrambled. You can study them. As soon as you start, your time starts. I've done all 25 in under 25 seconds a bunch of times. This is fun, but once you've done it a few times, the novelty wears off. I think this game would be excellent for Alzheimer's patients. Keep the brain/finger connections sharp! Check out the cool art work. 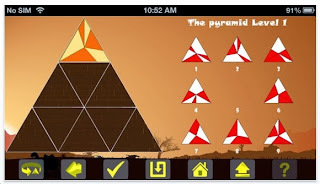 The object of The Pyramid Puzzle is to align the tiles so the colors match. I did level 1 in about 5 minutes. The graphics are actually pretty slick when you want to rotate a piece. Level 2 costs $.99 and it appears that there's no level 3! Sorry, this will never appear on any list of Best Puzzle Apps of 2014. 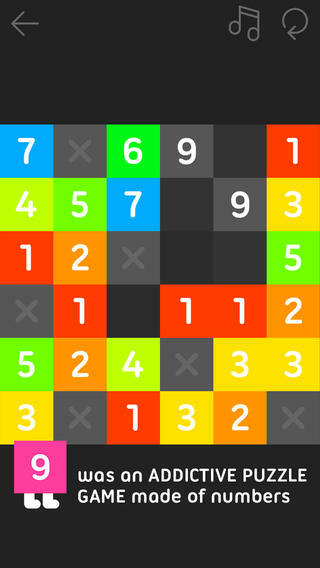 Colors - the Addictive Game: is a topology type puzzle game app. Look at the image: The object is to connect a path from one dark blue circle to the other dark blue circle. You must pass over either: other blue circles, gray circles or circles with stars in them. When you have succeeded, those circles will all turn gray. Then you must do the same for the other colors. About the circles with stars: if you traverse one of those circles, you will not be able to use them again. Even more: you will no be able to use any of the other circles in that path - if you used a star. There are 100 levels. I've done all the free ones - 49. I was stuck on level 6, not really sure what the rules were. Once I got past it, I did the rest of the levels pretty quickly. Colors - the Addictive Game is definitely fun and original. Ripoff Alert: Island hOpping appears to be an exact copy of ThinkFun's River Crossing. Not only that, there are only 2 free levels. What makes matters worse is that the developer doesn't seem to realize that 'your man' can and should stand on the poles. Everything about this is simply dreadful. About 10 years ago ThinkFun produced 4 versions of Plank Puzzles with their standard 40 challenge cards, plastic/wood pieces. They called it River Crossing. 9 (Free) comes from http://iojoe.com/9/. Last year he produced another puzzle app game called 10 that had the same objective: slide the numbered tiles around so they crash into each other and form 9. The gray X's? They are fixed and numbers cannot crash into them. I have not played this game much because I still have not finished all of the levels from 10 which I really liked a lot. 'Parks - Seasons Free Brain Teasers' comes from Andrea Sabbatini. Andrea produced '84 Logic Games'. I reviewed that ages ago when it was called '63 Logic Games'. The object in Parks is to place 2 trees in each colored region. Trees cannot touch - not even diagonally. Also, 2 trees must be placed in each row and column. For the smaller grids, like the one pictured above, you must place 1 tree in each column, row & region. About a year and a half ago I reviewed Twin Beams, which is basically the same concept. Click here to read that. Parks Season is a fine set of puzzles, but I must confess that Twin Beams is more polished. 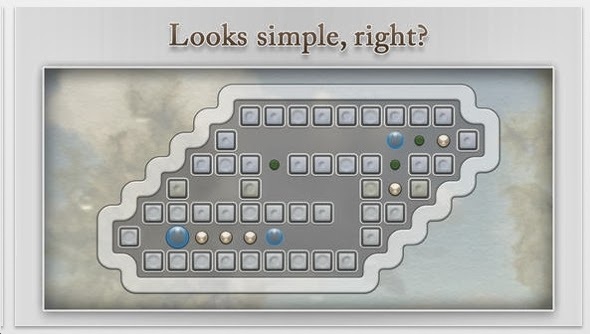 On the plus side, Parks Seasons has the very easy puzzles for novice puzzlers. 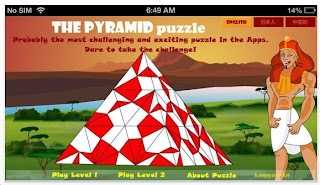 Muddle Nut is a free puzzle app game. The objective is to move the dots around so that none of the lines intersect. Robert Alvarez has produced some very good puzzle apps recently: Blinky's Escape and Puzzle Chain Reaction.You Have One Box is the latest. Your task is to move the man and the box to the exit. Look at the image shown. First you should move the box onto the flat blue rectangle. That will open the door for the man to escape. Later you will have to land on the other blue rectangle and red rectangle. There's an element of timing and you might want to evade the spinning blades. There are 12 levels. I've solved 8 of them. I like this game. My only qualm is that moving the box/man is a bit too fidgety. Sudoku Mine comes from Stanley Lam. Stanley has produced many good free puzzle app games the past 2 years. I can't keep up! 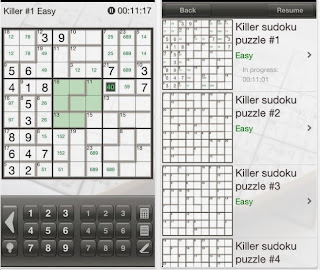 Sudoku Mine is a mixture of Minesweeper and Sudoku. It's closer to Minesweeper. The object of Sudoku Mine: place 3 flags to represent bombs. Each row, column and square region must have exactly 3 bombs. There are 50 free levels ranging in difficulty from beginner to extreme. I did 49 of them and am stuck. Fabulous, fast & fun. I bought the full version for $1.99. Of course, I have to keep play testing other puzzle apps. The $1.99 was my way of saying thanks for 3 hours of entertainment. 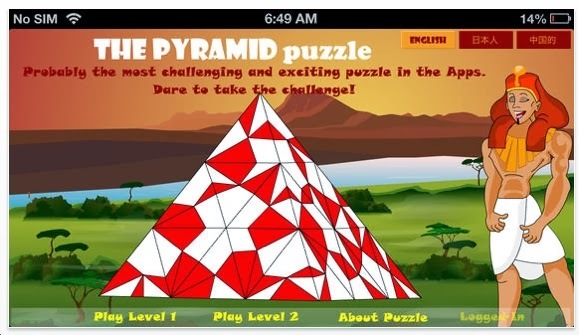 Puzzle Chain Reaction is the newest puzzle game app from Robert Alvarez. He's created a lot of good games, including Blinky's Escape. The goal of Puzzle Chain Reaction is to explode all of the circles with a limited number of taps. The concept is not new. However, Robert has added some interesting features. For example, bullets cannot pass through blocks. Also, the red circles cannot be tapped. There are only 20 levels and they get very tricky starting at level 10 or so. I particularly liked levels 13 & 14. I have not solved them all yet. the annual New York Puzzle Party Symposium will be Saturday February 15, 2014. This is the day before the Toy Fair at the Javits Center. If you are interested in attending and/or giving a talk/presentation, please contact me for more details. Cutrofello at Hotmail dot you know the rest. 3 years ago I posted a review of the original Quell. Click here to see that. 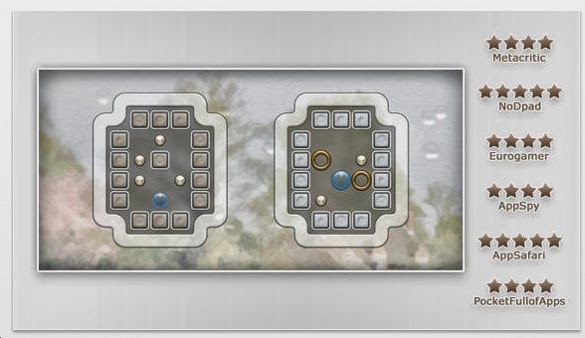 Quell is a tilt/swipe puzzle game app. The object is to collect the little tokens by swiping the blue water bubble. Quell Reflect is polished. The puzzle are challenging, but not impossibly so. There are some interesting features: worm holes, deadly spikes and male/female blocks. There are approximately 80 levels. Right now I've done about half of them. 2014 is off to a good start. Correction: Quell Reflect came out in 2011. It was recently updated and that's why I thought the game was new. Years ago I bought a puzzle magazine called Killer Sudoku. It's a combination of Sudoku & Kakuro. Each region has a little number in the top left corner. Those cells must add up to it. 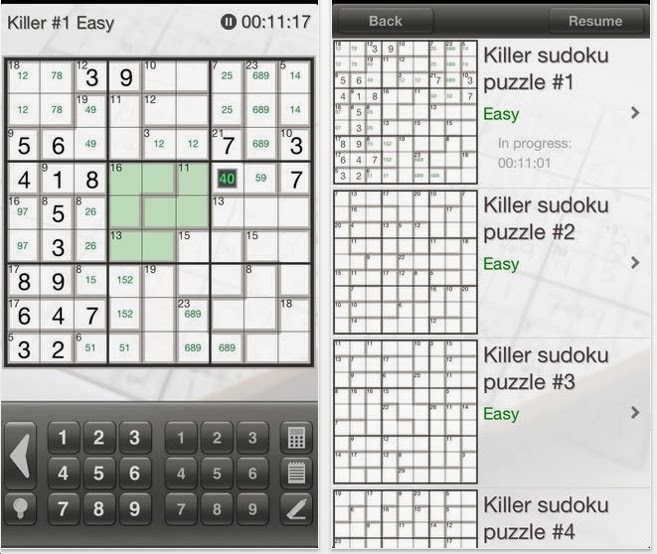 Sudoku Killer is a free puzzle app game that's exactly the same. There are 10 free puzzles. After that, every set of 50 puzzles will cost $.99. Not a bad deal considering those 50 puzzles will take up a solid 5 hours. You can buy 850 puzzles all at once for $4.99. I've done 2 of the 'hard' levels and each took me about 20-25 minutes. Do the math & those 850 puzzles are a bargain. Addendum: I bought the 850 puzzles and I do these while 'watching' tv. The easy ones take a minimum of 10 minutes. Absolute bargain.